Jimmie Watters Monteith Jr. was born in Low Moore, Virginia, on July 1, 1917, as the youngest of three children. He graduated from Thomas Jefferson High School in 1937, and he enrolled in mechanical engineering at Virginia Polytechnic Institute and State University, where he played football as a member of the class of 1941. The six-foot-two-inch redhead was inducted into the U.S. Army in October 1941 and completed basic training at Camp Croft, South Carolina. Monteith was then accepted to the Officer Candidate School at Fort Benning, Georgia, for a three-month officers’ training course and was commissioned a second lieutenant on June 20, 1943. At his request, he joined the Big Red One in May 1943 and fought in North Africa and later in Sicily, where he earned a battlefield promotion to first lieutenant. On D-Day, Monteith and his platoon of L Company, 16th Infantry, were among the first ashore at the Fox Green sector of Omaha Beach. Under intense enemy fire, Monteith courageously led two amphibious tanks into firing positions from which they silenced two enemy pillboxes. Disregarding a withering hail of enemy shells and machine-gun fire, he then led his troops through the barbed-wire entanglements and up the heavily mined bluffs. As they pushed inland, he and his men were eventually surrounded by the enemy. One month shy of his 27th birthday, while leading the defense of his unit’s position, he was killed by enemy fire. The Virginian’s heroic feat posthumously earned him the Medal of Honor. 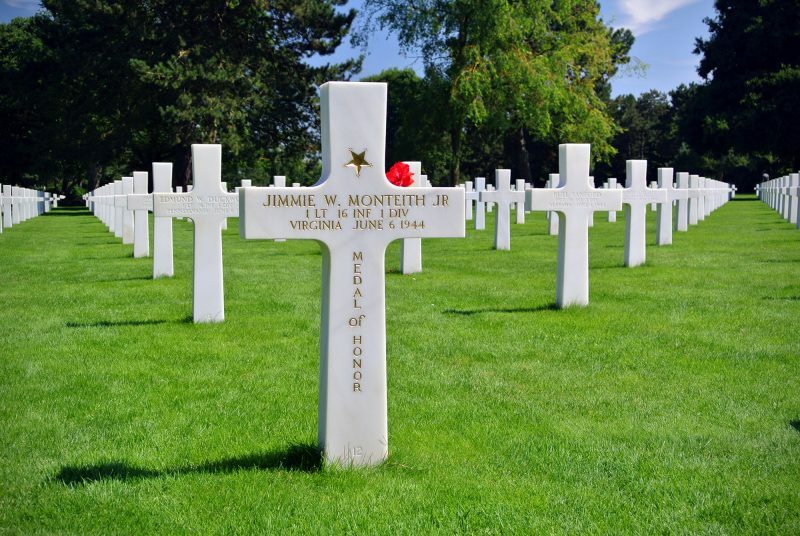 First Lieutenant Jimmie W. Monteith Jr. was buried at the Normandy American Cemetery a week after his death. A simple white marble cross with a gold star and gold lettering that bears his name, rank, unit affiliation, home state, date of death, and the words “Medal of Honor” marks his gravesite.